The fight will really be interesting, because both athletes are not straightforward in their styles, they can pull with different techniques and so we can expect that on the day of the fight we will see not only a confrontation of strength and technology, but also a tactical struggle. Over the past few years, we have witnessed the true reincarnation of Dmitry Trubin. We remember his world champion in categories up to 100 and up to 110 kg. 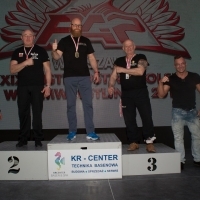 But after his return in 2015, first on the Asian Cup, and then on the Zloty Tur, we saw a completely different Trubin - with a weight of more than 120 kg, he was ready to deal with the world's top pullers. At that Zlott Tur, in the absence of Denis Tsyplenkov, Andrey Pushkar was the undisputed favorite, and no one believed in intrigue, waiting for the next first places of Andrey. Dmitry in the course of the tournament "gave his hand" without a fight to Andrey. The tournament came to an end and there was the last fight, in which Andrey and Dmitry met again. What was after the command "go" we all remember, and that story and the duel marked the beginning of the confrontation, which lasts to this day. After Dmitry was invited as a participant to a professional event - Vendetta, in which he defeated Michael "Monster" Todd and won the title of intercontinental champion PAL. Dmitry was very well prepared for such a difficult opponent as Michael, and showed an excellent technical arsenal. At the next Vendetta Dmitry pulled for the title of world champion PAL with Andrey Pushkar, but then he was not ready to cope with the power of Andrey and lost in the duel with a score of 1:5. Then, at the Zloty Tur-2016 Trubin took the gold in both hands in the category of +105 kg, but, most likely, it became more important for him to pull with Andrey on right hands, in which he still managed to win. After Dmitry still pulled in several tournaments, where there were successful and not very successful performances, but this stage can already be considered a past, but the transformation of Dmitry Trubin continued. A long stage of preparation, and he is preparing to put on the fight for about 140 kg of muscle mass. The new shape of Trubin has already "checked" on the recent Asian Cup, where he won, it seemed, without even getting warm in the course of the fight. To see Dmitry Trubin's new shape in full force will be very interesting! Dave Chaffee is a big and strong guy from Pennsylvania. Dave is difficult to call a professional athlete in full understanding, like many other armwrestlers, because sport is not his main activity, Dave is an officer in the correctional institution. But if you look at his struggle, on his results and the list of defeated opponents, then no one will be able to doubt his professionalism. At home, Dave is very successful at local tournaments and in local leagues, but not only in the US. On the first his Zloty Tur, Dave managed to pull the unbeaten Denis Tsyplenkov! After that, we saw his victories and defeats, but Dave definitely established himself as a top-ranking sportsman. For the upcoming fight, Dave is very serious, he has long preparations for his fight. We know that an athlete uses very large weights, but his training is not only about lifting weights, but also time is spent studying his opponent: "I've watched numerous matches of him…That is part of my training. I visualize myself in my matches against Dmitry. How I'm going to start, in certain positions and how the match will end in my mind". Dave works on endurance, consults with the best armwrestlers, specifically selects sparring partners to imitate the fight of his opponent and understands that he has to fight with a rival who will be younger and heavier than himself - "I'm going to leave everything I can at the table. I think this fight will be a war". Perhaps this fight really will be the most interesting. Dmitry probably wants to get a chance to compete again for the title of world champion in the PAL version, and Dave is unlikely to cross the ocean without expecting victory, we are just waiting for the war at the table. Who would we bet on? It is difficult for us to analyze the duel and this will be the only pair where we refrain from the forecast.